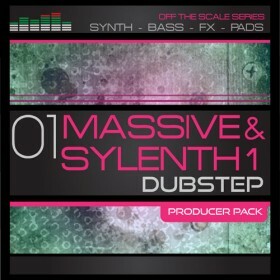 Massive & Sylenth - Dubstep Off the Scale Reduced price! For few years since now software synths, are the same quality as a hardware units. One of best synths that can be run both on PC and Mac is classic Virtual Analog Sylenth1. Basic synth sound is perfect, fx section is fully equipped. Computer consumption is ultralow. Sounds inside synth can be also multi layered inside one patch. Perfect sounding Unison, possibility of panning, control of stereo spread of each oscillator independently for each layer, makes that this synth was used in huge numbers of tracks released by biggest and best producers around the globe. We also having really useful soundbanks, for this great synth. Top popular sounding presets, divided into proper genres are waiting to be checkout. If You want to create a track or even full album our Sylenth1 presets are great for this purposes. To give even more quality to Our soundsets, we have enhanced some of them with Midi files. In this way You can load both midi melody and preset sound into Sylenth1 in your favourite DAW. This website utilises COOKIES according to settings of your web browser. For more information please read cookies policy.